Brilliant Pet ScoopFree Review – Find the best automatic litter box here! The Brilliant Pet ScoopFree Self-Cleaning Litter Box, designed by students from MIT, promises to take away the chore of scooping cat waste for up to 30 days at a time. That’s longer than most other automatic boxes, so how does it work? 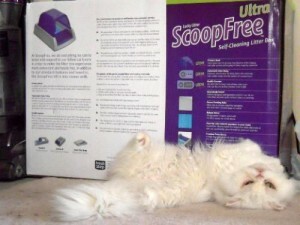 The ScoopFree uses a rake system to capture and collect waste within 20 minutes after your cat uses the box. Waste then goes into a covered compartment, and you can dispose of it at your leisure. If the cat goes back in the litter box, the 20-minute timer gets reset. The ScoopFree box doesn’t use standard cat litter. Instead, it works only with proprietary blue crystal litter trays. The litter is made to absorb wetness and odor, and the bright blue color is much prettier than the bland gray of typical cat litter. These crystals are 99% dust free and don’t track. They also weigh less than standard litter, and you’ll need five to 10 times less of it to fill the box. By blowing a fan at the litter or placing the pan near an open window, the litter will last even longer. The Original version of this box doesn’t have a lid or covering, which you might like if you have a large cat. This could also be a problem, though, if your cat needs privacy to “go.” If you do want a hood, you can purchase one here from Amazon. One box supports up to two or three cats. ScoopFree recommends changing the trays every seven to 10 days if you have three cats or every 20 to 30 days for one or two cats. ScoopFree offers a generous 90-day money-back guarantee. If the box breaks, you can get a free repair or replacement within one year of your purchase. ScoopFree even offers to pay return shipping. This box is available in Original or Ultra versions. The Ultra version costs about $30 extra, and it comes with a privacy hood that you’d otherwise have to buy separately if you got the Original version. It also features an adjustable rake delay and a health counter. The health counter meter tracks your cat’s box usage so you’ll know how many times it’s used the box each day. This is very handy if your cat has special health needs and you’ve got to monitor its bathroom use. The ScoopFree requires that you regularly purchase proprietary litter trays. You might not like this if you’re looking for a one-time purchase litter box. If your cat has large stools, there might not be enough litter in the tray to fully cover them. Waste may get stuck on the rake tines occasionally, but this can be cleaned off easily with a litter box scooper or paper towel. Click here to buy the ScoopFree litter box or learn more on Amazon. Watch the video below to see the ScoopFree in action. Do you own this product and need help? Go to the ScoopFree Frequently Asked Questions page. To return to the Automatic Litter Box Reviews home comparison chart, click here. What’s the Best Cat Litter for Automatic Litter Boxes? What is the Best Cat Water Fountain? 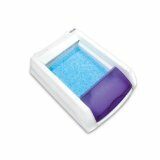 Automatic Litter Box Reviews is a participant in the Amazon Services LLC Associates Program, an affiliate advertising program designed to provide a means for sites to earn advertising fees by advertising and linking to amazon.com.